Havan (fire ceremony) and Mahamrityunjaya (healing mantras) are chanted for the sankalpa of peace, plenty and prosperity, health and happiness for all people and the environment. Friday is the day dedicated to appreciate the qualities of the divine shakti in the form of nature, grace, beauty, kindness, excellence, gratitude, applied wisdom, joy and many other qualities. Havan includes the physical fire, yantra (creating an auspicious space with flowers, incense, oil lights), rangoli (design) and the chanting of specific devi mantras which are the outer tools for inner transformation. Please phone or email the day before or by 2pm on the day to make your booking. The Vishnu Gayatri is chanted to invoke personal upliftment, uniting us with our inherent positivity to live life with the qualities of discernment, integrity, nobility and sincerity. The mantras also include embracing these qualities in the environment at the Ashram for the light of yoga to burn brightly. May these noble qualities also be part of your expression in the world. 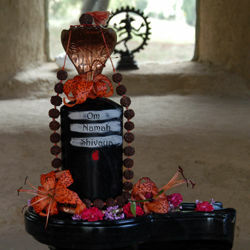 Om Namah Shivay is chanted for the expansion and liberation of consciousness for the individual and the environment. Various symbols and actions are used to redirect our senses and heighten our sattwic emotions. The fire represents God or truth. The sacrificial food, the samagri (mixture of seeds, plants, resins, grains, etc.) is offered into the fire. The mixture represents our worldly samskaras such as attachment, greed, violence, etc. that bind us to our lower nature and trap us in egocentric thoughts and desires. We offer the seeds of all future actions into this fire of self-knowledge to be completely consumed. 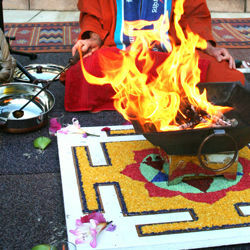 Symbolically we are offering our very lives into the fire of purification and sacrifice. While a specific number of people will actually offer the samagri, each of us can participate equally in the ritual by the degree of our sankalpa, awareness and surrender. The offerings are substances that sustain life and always the best quality available is offered. Many of the items are natural antiseptics and aromatics. As they burn, the subsequent vapours pervade the atmosphere, destroying pollutants and purifying the environment for many kilometres around. The vibrations of the mantras enhance the beneficial effect of these vapours. This ritual not only benefits the external environment, the participants of yajna also benefit as purification takes place in each individual's internal environment as the vapours and mantras permeate the physical, mental, emotional and spiritual entity. The outer form of any ritual has an inner corresponding ritual. In yajna, Agni is the divine spark within the human being, the spirit or soul. The ghee or the clarified butter that is offered to Agni is symbolic of the mind. 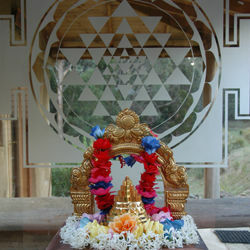 The annam, the sacrificial food, symbolizes the physical body which is the transformed state of annam. Once the divine spark of Agni is invoked, the latent energies or divine powers hidden within man awake to share the fruits of the sacrifice and assist the individual's purification, transformation and spiritual awakening.